Last Monday in Brooklyn at a West Indian Day parade, two black people walking through a blocked-off area were stopped by the police, wrestled to the ground, and detained for a half hour. In most instances, this would have been a lamentably unextraordinary event. But in this case, the two detainees were Councilman Jumaane Williams and his public advocate aide Kirsten John Foy, both of whom had received permission from the police to be in the area where they were arrested. This is the sort of police harassment that, rather than disappearing into anonymity, finds its way into national newspapers: Indeed, Williams made sure of it by calling a press conference the next day. Which is not to say that the subsequent debate has proven particularly enlightening. For every rote charge of racial profiling, there has been a voice eager to dismiss the arrest as a mere misunderstanding. Mayor Michael Bloomberg, for instance, blithely suggested that everybody “get a beer,” in the vein of the “beer summit” that President Obama hosted in 2008 with Harvard’s Henry Louis Gates and James Crowley, the officer who had famously arrested Gates on his own front porch. But Jumaane Williams’ arrest is instructive precisely because it’s not analogous to Gatesgate. It shows us, namely, that pernicious racial profiling is not a situational problem, but a structural one. 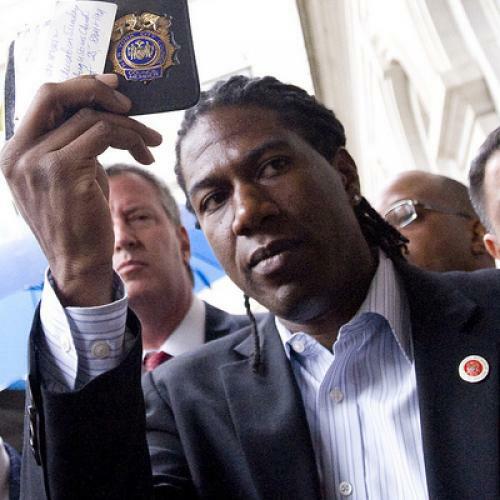 Jumaane Williams’s arrest was not just the product of a single interaction gone wrong, but a reflection of the fact that police procedures have yet to catch up with broader changes in American culture in general, and black culture in particular. IT IS ALMOST IMPOSSIBLE to suppose race wasn’t part of the problem, of course. It is technically possible that two white men walking through that area and showing their badges would have wound up handcuffed with their faces in the dirt, but only that. Still, the NYPD officers in Brooklyn that day were operating upon a stereotype more subtle than a simple racial one. Not all black men would have been as likely to suffer the treatment Williams faced. I sincerely suspect, for example, that I would have been rather less likely to suffer what Williams did. Williams directly addressed this point in his press conference. He noted that his treatment was due to his being, certainly, young and black, but also to his wearing dreadlocks and an earring. That is, the cops read Williams as “street,” despite that he is a municipal lawmaker, not to mention college graduate with a Master’s Degree. That impression was likely furthered by Williams’ speech patterns. Williams hardly talks like an unlettered “thug” and is thoroughly effective in communicating with an audience. However, in his public speech his vowels, cadence, and tendency to substitute “-in” for “-ing” are, in combination, very much those of a black working-class New Yorker. I should be clear that Williams is not to be faulted for any of this. There was a time when those aspiring to public roles took elocution lessons or just subconsciously developed a “tony” style of speaking in public. This was as true of blacks as whites: Booker T. Washington, born in slavery, sounds quite “white” in recordings, as do old-time prominent blacks such as A. Philip Randolph, James Weldon Johnson and W.E.B. DuBois, and in their era no one considered that unusual. But those days—when a New York City councilman of any race may have been expected to have been a bespectacled sort with a walking stick addressing people as “My good man”—are long gone. Williams, who grew up in the eighties and nineties, certainly is not of that era. He came of age in a much more demotic culture, one that has abandoned traditional hierarchies and placed the “authentic” on a pedestal instead. As such, Jumaane Williams, like many other successful black people of our day, looks, sounds, and carries himself less like his societal equivalents of old days and more like their less-accomplished peers; nor does he (nor should he have to) particularly aspire to anything different. What this means, however, is that cops who are attuned to thinking of all black men with that sense of demeanor, diction, and style as potential thugs are now grievously misreading the populace they serve. Cops accused of profiling commonly object that they look not just for black skin but for a “certain kind” of black person reasonably suspected of malfeasance of some kind. However much sense that justification once may have made, it doesn’t hold water in our current culture. After all, how do police propose to define “a certain kind” of black man? If it’s by a certain black vernacular speech pattern (ie: “Hode on” for “Hold on”; “Ah see” for “I see”), dreadlocks, and a certain way of walking, then the profile is essentially useless, as in 2011 it takes in men of an unprecedentedly wide range of classes, educational level and temperaments. Cops now have to be primed, in other words, for the possibility that this “certain kind” of black man may be a City Councilman. Fortunately, there is some good that may come of this incident. Williams and Foy have been using it to highlight the general issue of how New York City cops treat young black and Latino men, an issue that deserves far more attention. If young brown-skinned people today often harbor a hatred of whites that would seem to have made more sense fifty years ago than today, that’s largely because of their relationship with the police. For many inner-city kids, in particular, encounters with snarling cops like the ones who pushed Williams and Foy into the dirt are the main interactions with whites they ever have. And when a generation of black and brown kids grows up thinking of the cops as a band of surly and sometimes violent white guys, it’s lost in many ways. One need not wonder why bands of black boys form “flash mobs” with the express intent of harassing white people. Nor can it be a surprise that so many inner-city brown kids have trouble responding to or trusting a white teacher, as reported in sadly ordinary accounts. The fraught relationship between black men and police forces is, in fact, the main enabler of the impression among so many blacks—as attested to by everything from Gates’ notorious “Why? Because I’m a black man in America?” riposte to Crowley’s arresting him, to the irrepressible popularity of the gangsta rap genre—that racism is a dominant factor in their lives. Racism, alas, is too vague and inchoate a charge to serve as a proper diagnosis of blacks’ problems with police. The cops who harassed Councilman Williams may not have had a lack of personal or racial empathy, but rather a deficiency of aptitude of black culture. In any case, the problems are not of the sort that a “beer summit” can be expected to solve.